If there is one priority for me when it comes to purchasing new gear, it’s this: I need flexibility. I’m a solo acoustic guitarist who uses public transportation almost exclusively, and what that translates to is that I don’t have a lot of cash to drop on gear nor can I haul it around with ease. So when I’m on the hunt for new equipment, I often go for the equipment that manages to perform multiple jobs, weighs very little, has a reasonable price tag, and sounds transparent—in other words it’s flexible. As you may know, those are some lofty requirements for gear. However, it was those requirements that brought me to the Sunburst Gear M6BR8 portable speaker with Bluetooth capabilities. I was on the search for a good live sound set up. I’d been using a Fishman Loudbox Mini, but I just wasn’t pleased with it’s sound and it’s lack of features. Also, I had just graduated to using a nice reverb pedal and no longer needed the built-in reverb of the Loudbox Mini. Still, I knew that I needed something that was small, lightweight, powerful enough for small to medium gigs, and most importantly, something that sounded absolutely fantastic. I just wanted something that would make my guitar sound bigger and louder and not cloud the tone that made me fall in love with my guitar. A friend suggested I check out the Sunburst Gear line, and I knew right away that it was the answer to my nightly prayers to the audio equipment gods. And that’s just what the Fishman Loudbox Mini doesn’t have. You can also use an additional speaker from Sunburst Gear to build a dual speaker PA system. The main speaker will act as the master mixer and the additional speaker as the slave speaker. With this set up, you can get a wonderful stereo image. Those features are all lovely of course, but I’d like to turn to the ultimate reason I went for this speaker. The nearly infinite flexibility. 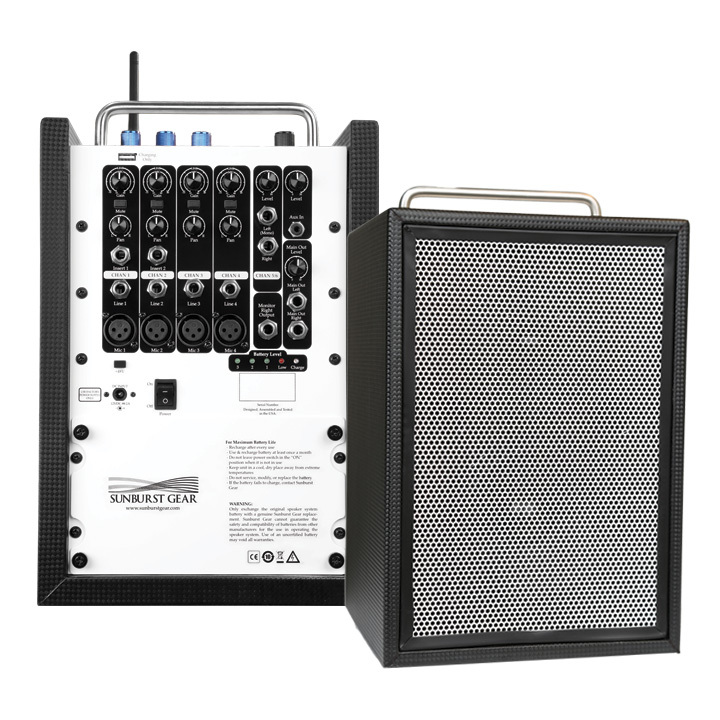 You can take these anywhere and voila, you have a battery-powered PA system with a six-channel mixer built right into the back. This little speaker can manage multiple instruments and dynamic or condenser microphones simultaneously, so it’s not just for the solo performer. This speaker is a Swiss Army Knife equivalent for the live sound world. No, there’s no gimmick here. The Sunburst Gear MM speaker line has been rated and reviewed by other sources as top-notch studio-quality speakers (check out the review over at ProSoundNetwork.com). That being said, I use them as such. When I’m not gigging with these, I have them on my desk for monitoring purposes. I can easily switch between mixing a recorded track to using them as an amp to practice a live set to dial in my tone with the other gear I use (more on that in other posts). I’ve also set these up as a portable DJ PA at a party, and they sound awesome with just about any music you like to hear through them. One more thing, they’ll act as stage monitors. Did someone utter flexibility earlier? That’s like three (maybe four) speaker systems in one! Now, what I’m getting at here with my hang-up on flexibility is that you’d have to spend three times the amount for all these features and or gear that can perform at this level in each of these situations. This speaker handles everything. Let’s take a look at what could be improved on these speakers. I feel confident saying that the only things I’d change about them are the lack of an auxiliary effects send and return loop for the whole mixer, and the fact that they’re not as loud as a bigger PA (which quite frankly isn’t an issue since these are not for situations where you’d need that much power!). I’ll also admit that 24 pounds is still a little on the heavy side for an easy haul, especially if you’re using two these. However, it’s not that bad, and unless the whole thing was made of plastic, it could never weigh less and still have all the functionality it boasts. Sunburst Gear’s MM speaker line definitely passes my flexibility need, 000000with flying colors. However, I have one last thing to add. Don’t forget, acoustic guitarists, that acoustic guitars were meant for acoustic performances and not electric ones. These speakers will enhance and reinforce your acoustic performance, not make it a rock concert, which is my goal and may be yours as well. If we share that goal, I highly recommend that you visit SunburstGear.com to learn more and order this speaker for yourself!